Abdominoplasty is a very good procedure, especially for women who have had children. Pregnancy usually causes skin laxity and separation of the abdominal muscles (diastasis recti). Stretch marks are also common after the pregnancy. 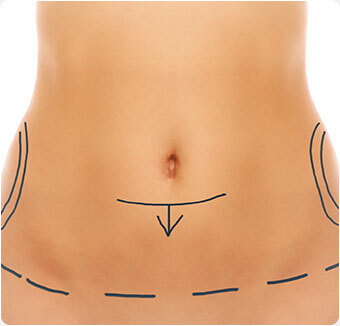 An abdominoplasty (tummy tuck) can help you get rid of this excess loose skin. Abdominoplasty, more commonly known as a "tummy tuck" is a major surgical procedure used to remove excess skin and fat from the middle and lower abdomen and to tighten the muscles of the abdominal wall. The procedure can dramatically reduce the appearance of a protruding abdomen. The surgery is performed through a lower abdominal incision, which is usually hidden. The skin is stretched down and additional skin may be removed. Suction (lipectomy) can be combined and performed in some cases on abdomen, hips or elsewhere. Your doctor may select general anesthesia, so you'll sleep through the operation. A Mini Tummy Tuck or partial abdominoplasty, may be recommended for patients that are within 10% of their ideal body weight. A Mini Tummy Tuck is a variation of this procedure that removes and tightens skin only below the umbilicus (belly button). It is usually combined with a liposuction of the entire stomach and, if indicated, the hips and the thighs. LENGTH OF PROCEDURE: 2-3 hours. RECOVERY: Return to an office job is possible 1 week after the surgery. RESULTS: Visible after the scars have healed, approximately 3 months after the surgery.